very good to spread the message. People who do not believe in god would never say "god is dead" or "I hate god", they'd say "there is no god" or "there's zero evidence for god". This awful movie is another excellent example of the religious coming up with an unrealistic premise and then triumphantly "proving" their point. This movie was well worth going to see in theatres and we will definitely be purchasing the DVD. I gave it 4 stars and not 5 because there were a few scenes that were a bit 'cheesy' or far fetched. Other than that, there were many different situations that were represented and addressed very well. It's so refreshing seeing this type of movie hit the big screen. Can't wait to see what David A.R. White comes up with next. If this movie had any A or B list actors it would win every Razzie there is. Saw this movie on a dare but I was glad I didn't have to pay for it. This movie is HORRID! Dean Cain can't act nor could he ever and Sorbo was ok, just ok. Seriously this movie will lower your IQ and over all brain function. DO NOT WASTE YOUR TIME! Tackles some very trying emotions, was well written and had a good message. Highly recommended to anyone with an open mind. Dumb. You gotta be brain dead. An awesome movie, I will go and watch it again and definitely will purchase it when it comes out in DVD. The best movie I have seen in years!! This was a refreshingly fine film with substance! Totally enjoyable although, sadly, I'm sure that the professional movie critics will roast it, as it is Christian-focussed. Their loss. God is NOT dead! Great movie! One of the best movies Ive seen! Loved it! I would say this movie is a must see, it is entertaining and has a great story to it. Some of the acting isn't the greatest but for the most part it's pretty good. I really enjoyed it and will watch it again. I thought this movie was fantastic!! Very good acting. Solidly put together. Enjoyed every minute. I have seen it twice with different people, which is a first for me. Glad it came to Canada. Lord is not dead! Coruption in America and all over the World started in 1990s...God has a plan for each of us for His purpose...we must understand Bible to be Christians...Lord saved me and my Family! Those who say that they are God ...those are the false idols ...think people ,do not sleep! 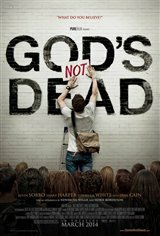 Best Christian movie i have seen in awhile, it's a must see GOD'S NOT DEAD!!!!! This movie is ignorant and promotes religious intolerance. As a non-Muslim, non-atheist I was shocked and upset to see something like this playing in Canada. Enjoyed watching the film and acting of Shane Harper in particular. An excellent film that is both thought provoking and inspirational. Well written with good acting. Reconfirmed my belief that God is most definitely NOT dead! This movie is awesome. Great acting and an excellent plot. It is enjoyable whether you happen to believe in God or not. Go see it - before you judge it. Its a good movie but why would you post a review if you haven't seen the movie. Don't judge a movie because of the name. Actually go and watch it before you comment. THOUGHT THIS WOULD BE BORING, WAS SO WRONG, IT REALLY MADE ME REALIZE THERE HAS TO BE AN ALL KNOWING, ALL POWERFUL AND ALL PRESENT CREATOR TO PRODUCE ENOUGH HEAT FROM A SUN THATS 90 MILLION MILES AWAY WHICH STILL DOES NOT BURN US UP SINCE WE ORBIT AT 23.5 DEGREES TO THE SUN TO KEEP FROM BURNING US INTO CHARCOAL. Excellent movie that presents the truth about the selective suppression of freedom of thought in universities, assumed to be places where fairness of a debate and freedom of thought is celebrated. A must see! Believable acting and well produced. Absolutely awesome movie! Well acted! Great story! Amazing plot! Great Movie. Exciting. Good Acting. Great movie... those who venture poor ratings without even seeing it... can't take your rating seriously. Terrible acting with annoying ignorance and propaganda. Amazing movie! Best movie of the year!! Excellent movie! Go see it! Such a refreshing movie, well done and extremely enjoyable. Just from reading the intro you know that this is a movie for people who wilfully chose to be morons.